Order your own copy of All and Nothing at your local retailer or online through our website today! 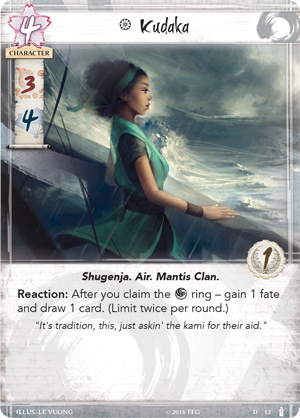 All and Nothing, the fifth Dynasty Pack in the Elemental Cycle for Legend of the Five Rings: The Card Game is available now from your local retailer or our website! Within the All and Nothing Dynasty Pack, you'll find a new exploration of the Void element, as well as the introduction of several unique characters, expanding on the themes of their clans found throughout the Elemental Cycle. A new Commander, Monk, and Meishōdō wielder enhance new strategies for the Lion, Dragon, and Unicorn Clans, opening up new paths to victory. Invited to the Imperial City of Otosan Uchi as an honored guest, Iuchi Shahai (All and Nothing, 91) has been tasked with teaching the Unicorn’s art of Meishōdō to the Seppun family. In teaching the Unicorn’s best kept secrets to outsiders, she finds herself torn between her duty to the Emerald Empire and her duty to her clan. 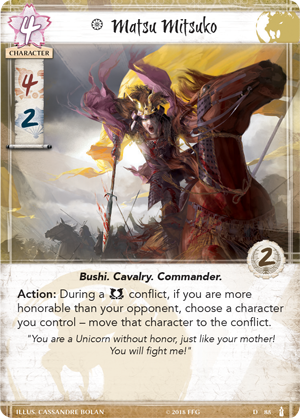 While Iuchi Shahai's covert ability makes her useful in nearly any conflict, her second ability makes her unique among the Unicorn. Shahai reduces the cost of Meishōdō attachments on herself or neutral characters by one. 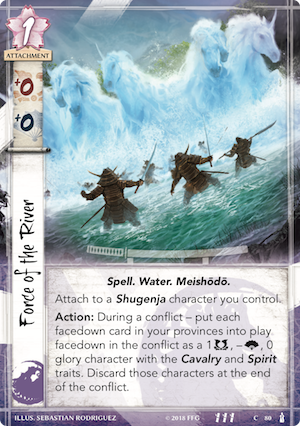 The Unicorn recently received a powerful Meishōdō attachment in the form of Force of the River (The Ebb and Flow, 80), and with Iuchi Shahai on the field, you can play the card for free before unleashing a swarm of Spirits on your enemy. 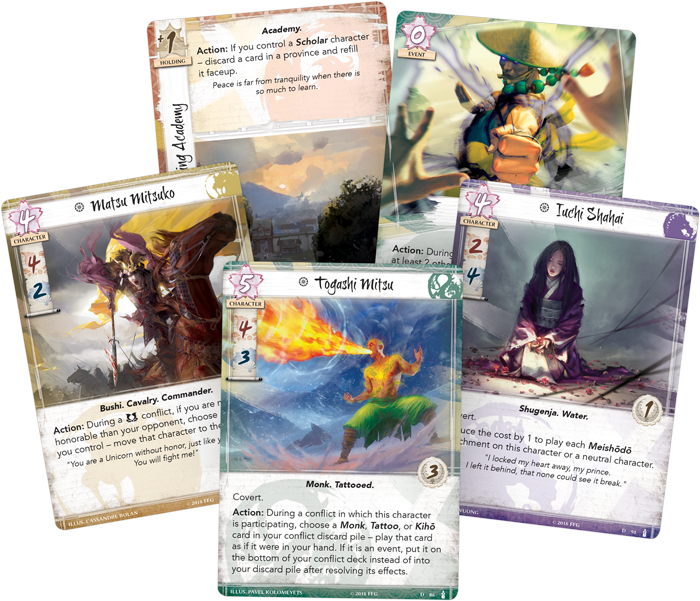 As a teacher, Shahai also provides a discount when attaching Meishōdō cards to neutral characters, making characters like the powerful Kudaka (Breath of the Kami, 13) a potential ally for Shahai and the rest of the Unicorn Clan. 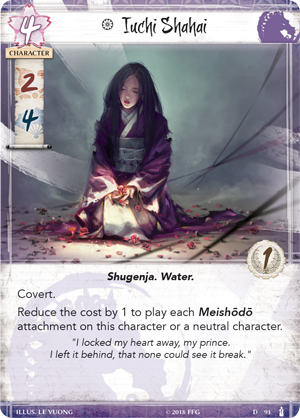 If your deck focuses on powerful Meishōdō magic, Iuchi Shahai provides an economic boost with a powerful covert ability to aid you in your conflicts. Iuchi Shahai isn’t the only character with covert in All and Nothing. Togashi Mitsu (All and Nothing, 86) is a powerful Dragon Monk, one who ties the Clan's themes together and gets the most out of every card. With four military skill and three political skill, he is a force to be reckoned with in any conflict. Not only can his covert ability help you slip past one of your opponent's biggest threats, his second ability allows you to get extra value out of your cards. 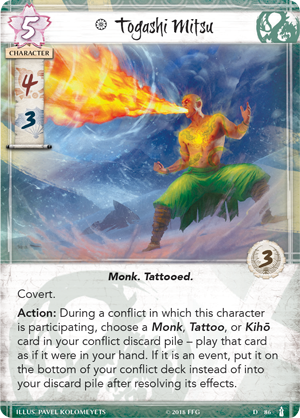 As an Action when Mitsu is participating in a conflict, you can choose to play a Monk, Tattoo, or Kihō card from your conflict discard pile as if it was in your hand. One of Togashi Mitsu's greatest weapons joins him in All and Nothing, the powerful Void Fist (All and Nothing, 94), a Kihō ability that lets you choose a character, move it home, and bow it. While this is undeniably powerful, it comes with multiple restrictions. 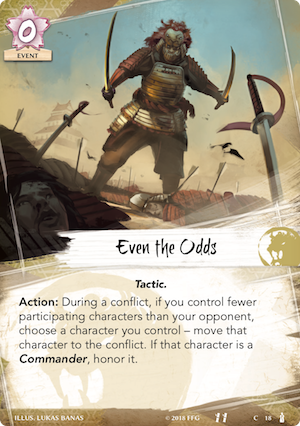 Not only does the character have to have less military skill than a participating Monk character you control, you must have played at least two other cards during this conflict, forcing you to plan ahead and wind up before you strike. 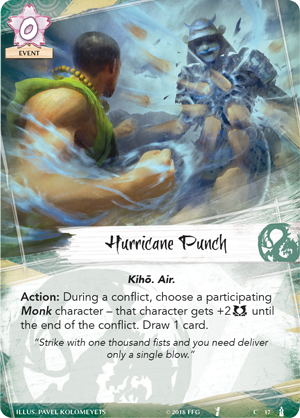 Of course, this synergizes well with cards like Hurricane Punch (Breath of the Kami, 17), which both increases military skill and replaces itself. While this is a powerful combo, it becomes even more potent with Togashi Mitsu on the field. 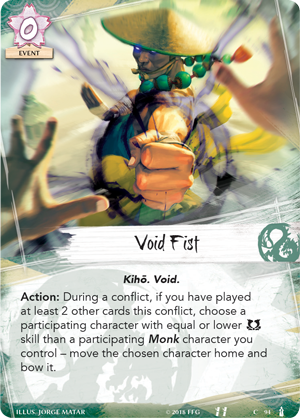 Not only can you potentially play Hurricane Punch twice, buffing his military skill to a massive eight, but this counts as playing two cards during the conflict, opening the door for Void Fist to be played. Togashi Mitsu and Void Fist are versatile new tools in the Dragon’s cache, and they give new reason for Rokugan to respect and fear their powerful Monks. Matsu Mitsuko (All and Nothing, 88) embodies everything noble about the Lion. A fierce warrior who places her faith in the honor of her clan, she inspires all around her to charge into battle alongside her. During a military conflict, if you are more honorable than your opponent, you may choose any character you control and move them to the conflict. Not only does this let you get a clear view of the battle before committing all of your forces, your opponent account for Mitsuko's ability to inspire your forces. Furthermore, as a Commander, Matsu Mitsuko is a valid target to be honored by Even the Odds (Breath of the Kami, 18). This allows her to be pulled into a military conflict, potentially adding six military skill to your side, and still use her own ability to add an additional character for even more skill. Matsu Mitsuko is a formidable Commander, and when she leads the charge on the battlefield, few can stand against the might of the Lion. These three characters each enhance the unique aspects of their clan, offering new strategies and new ways to dominate your foes. 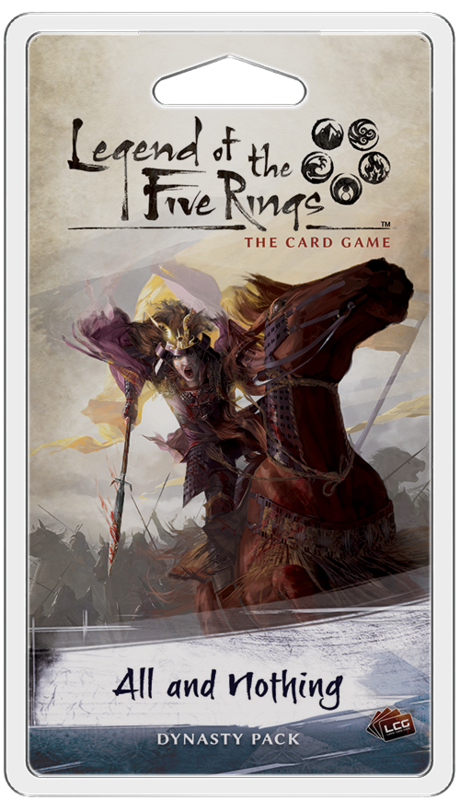 All this and more awaits you in All and Nothing, the fifth Dynasty Pack in the Elemental Cycle for Legend of the Five Rings: The Card Game! Embrace the Void. All and Nothing (L5C13) is available now from your local retailer or our website!